The Juliusz Slowacki Theatre in Kraków (Teatr im. Juliusza Słowackiego w Krakowie) was initially called the Miejski (Municipal) and opened in 1893 in a new building erected on Plac Sw. Ducha (Holy Spirit Square). The edifice, constructed according to a design by Jan Zawiejski, was modeled after the most beautiful theatres in Europe and is an exquisite example of Eclectic architecture. From Krakow to the National Arts reads the inscription on its marble façade, indicating how significant the founders of the newly created theatre's perceived the building to be, and how much they expected of the institution that would arise within it. The stage inaugurated its activities on the evening of October 21st with a program consisting of excerpts from Fredro's The Revenge, Slowacki's Balladyna and Mickiewicz's The Confederates of Bar. The theatre premiered its first full-length production, Fredro's Maiden's Vows, exactly four days later. Tadeusz Pawlikowski was the theatre's first director (1893-1899). He was followed by Jozef Kotarbinski (1899-1905) and Ludwik Solski (1905-1913) before once again resuming the position in the years 1913-1915. Lucjan Rydel ran the Slowacki for one season during 1915-1916 with Adam Grzymala-Siedlecki assuming the directorship for the years 1916-1918. Around the turn of the century, some of Poland's most outstanding actors were members of the theatre's ensemble. J. Michalik, The Krakow Theatre in the Years 1893-1918 in: The History of Polish Theatre, Polish Theatre in the Years 1890-1918. Kraków audiences have enjoyed performances of such artists as Kazimierz Kamiński, Ludwik Solski, Maksymilian Węgrzyn, Antonina Hoffman, Wanda Siemaszkowa, Stanisława Wysocka and Aleksander Zelwerowicz. Prominent theatre artists like Juliusz Osterwa and Kazimierz Junosza-Stępowski began their careers at the Słowacki Theatre, and actress extraordinaire Helena Modrzejewska (Modjeska) made numerous guest appearances. At the turn of the century, the province of Galicia was a center of modernist literature and art. Its theatres in Lviv and Kraków were the quickest to take on the new repertoire. The Kraków Municipal Theatre staged plays by Ibsen, Hauptmann and Maeterlinck, and premiered a number of Polish plays that would become famous, among them Zapolska's That One (1898), Kisielewski's In The Net (1899) and Przybyszewski's For Happiness (1899). Simultaneously, the theatre on Holy Spirit Square became the birthplace of the theatrical concepts of the Young Poland movement. This was strictly related to the discovery of Romantic drama and the activities of Stanislaw Wyspianski. In Krakow the Romantic repertoire which contemporary commentators had judged to be 'non-theatrical' came to the fore. Thus, the theatre mounted the first-ever productions of plays by Slowacki - The Golden Skull and Kordian (1899), Salome's Silver Dream (1900) and Reverend Marek (1901) - as well as of Krasinski's Un-Divine Comedy (1902) and Mickiewicz's Forefathers' Eve. The latter was staged according to a concept by Stanislaw Wyspianski, who was the first to combine all parts of Mickiewicz's work in a single production (1901). The significance of the Romantic tradition and especially Slowacki's legacy found reflection in a festival of this writer's plays that was organized in 1909. It was at this time that the stage on Holy Spirit Square adopted the name of the Juliusz Slowacki Theatre. Ultimately, however, Wyspianski determined this Krakow theatre's place in Polish stage history and its status. After all, the Municipal Theatre had mounted world premiere productions of The Varsovienne (1898), The Wedding (1901), Liberation, Protesilaus and Laodamia, Boleslaus The Bold (all 1903), as well as of Meleager, Sigismund Augustus, A November Night (all 1908) and The Legion (1911). D. Poskuta-Wlodek, The Performance is Repeated Every Day - The Juliusz Slowacki Theatre in Krakow 1893-1993. After World War I, the theatre was headed in turn by Teofil Trzcinski (1918-1926), Zygmunt Nowakowski (1926-1929), once again by Trzcinski (1929-1932), by Juliusz Osterwa (1932-1935) and Karol Frycz (1935-1939). 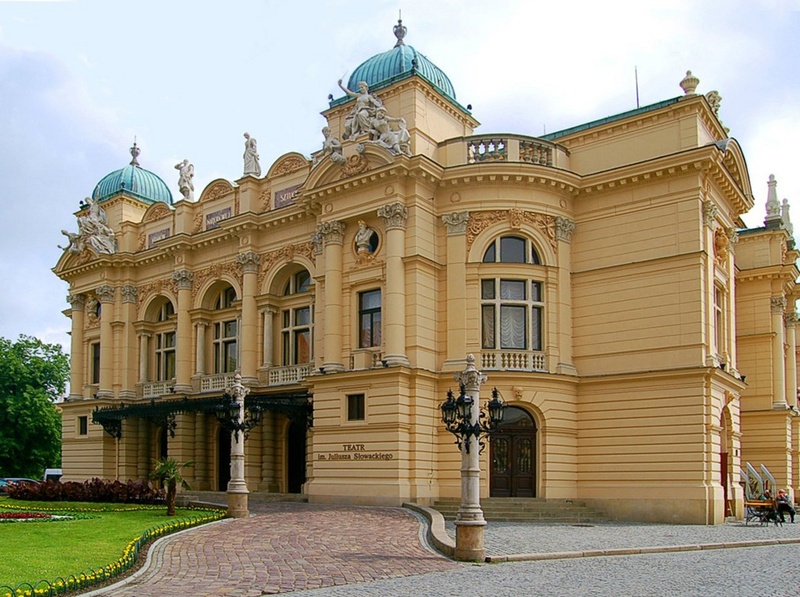 During the two inter-war decades, Krakow lost its status as the country's leading theatre center to Warsaw, but the Slowacki Theatre could still boast of having a very good ensemble and an interesting repertoire. Prominent actors like Stanislawa Wysocka, Karol Adwentowicz, Marian Jednowski and Jozef Karbowski appeared regularly on its stage, among scenery conceived by leading designers Karol Frycz, Iwo Gall and Zofia Stryjenska. The theatre was simultaneously the first in Poland to stage the plays of writers like Claudel, Pirandello, Yevreinov and Kaiser. The Slowacki also staged the work of debut authors, among them Witkiewicz (Tumor Brainiowicz, 1921), Zegadlowicz (The Oil Lamp, 1924) and Wandurski (Death on a Pear Tree, 1925). Productions like Kochanowski's The Dismissal of the Greek Envoys (1923), performed in the courtyard of Wawel Castle, Slowacki's Lilla Veneda and Shakespeare's Hamlet featuring performances by Wysocka, and the world premiere of Rostworowski's Moving (1930) grew to be legendary. The same was true of special appearances by Hanka Ordonowna and of the theatre's production of Morstin's The Republic of Poets (1934), in which the author, under the guise of characters with strange pseudonyms, depicted a number of well-known Polish writers, including Tuwim, Staff and Lechon. During the Nazi occupation of Poland, a German ensemble moved into the building of the Slowacki Theatre, which ultimately reopened in 1945 with a production of Żeromski's My Little Quail Has Flown. In the ensuing years, the theatre was headed in sequence by Frycz (1945-1946), Osterwa (1946-1947), Bronisław Dąbrowski (1947-1950) and Henryk Szletynski (1950-1955). Immediately after the war, the ensemble consisted above all of young actors like Tadeusz Łomnicki, Gustaw Holoubek, Halina Mikołajska, Aleksandra Śląska and Adam Hanuszkiewcz, who were later joined by Marian Szczerski, Mieczysław Voit and Stanisław Zaczyk. With the death of Solski in 1954, a certain period in the history of this Kraków stage ended. The Słowacki Theatre was largely able to avoid being inundated by titles from the Socialist Realist repertoire. (D. Poskuta-Włodek, Co dzień powtarza się gra. Teatr im. Juliusza Slowackiego w Krakowie 1893-1993). The theatre garnered recognition for productions like Lope de Vega's The Mayor of Zalamea (1951), directed by Władysław Krzemiński with scenery designed by Tadeusz Kantor, and Słowacki's Fantazy (1954), directed by Szletyński and designed by Andrzej Pronaszko. During the post-Stalinist thaw, Bronisław Dąbrowski was once again appointed director (1955-1972). This time Dąbrowski would run the theatre for seventeen years as its managing and artistic director. During the initial years of his tenure, Dąbrowski directed three important productions: Słowacki's Kordian (1956) as well as Wyspianski's The Wedding (1956) and Liberation (1957). In these stagings Dąbrowski sought to settle accounts with the Polish intelligentsia. Irena Babel, Erwin Axer, Władysław Krzemiński and Bohdan Korzeniewski all sought to explore and define historical mechanisms in their work, often granting their productions a persuasive message. This was particularly true of Korzeniowski, who in 1963 directed a heroic production of Mickiewicz's Forefathers' Eve with Marek Walczewski as Gustaw-Konrad. The theatre's relationship with Lidia Zamkow also took an interesting and tumultuous turn when Zamkow entered into conflict with the theatre's director after the premiere of her production of Dürrenmatt's The Visit (1958). She ended her collaboration with the Slowacki at this time and did not return to direct again until 1964, at which time she mounted productions of Brecht's Three-Penny Opera (1964), Shakespeare's Macbeth (1967) and Wyspianski's The Wedding (1969). All three productions featured actor Leszek Herdegen, who had an intriguing personality and granted his characters a note of resignation, solitude and warmth. In the 1960s scenery at the Slowacki was produced by some of the best Polish designers, old and young, including Andrzej Pronaszko, Andrzej Stopka, Karol Frycz, Władysław Daszewski, Wojciech Krakowski, Tadeusz Brzozowski, Adam Kilian, Andrzej Majewski, Krzysztof Pankiewicz, Lidia Skarzyńska and Jerzy Skarzyński, Barbara Stopka, Kazimierz Wiśniak and Krystyna Zachwatowicz. (D. Poskuta-Wlodek, Co dzien powtarza sie gra. Teatr im. Juliusza Slowackiego w Krakowie 1893-1993). In 1972 Krystyna Skuszanka and Jerzy Krasowski, a duo that had done much for Polish theatre, took over running the Słowacki. In 1976 the theatre opened an additional, small stage called the Miniature, which in time would prove to be the debut venue for many young directors, including Krystian Lupa. The new management adopted a repertoire based on Polish and foreign classics, though the works of contemporary authors were also staged. Productions in fact included previously un-staged works by Gombrowicz, Mrozek and Rymkiewicz, Beckett, as well as stage adaptations of literary works by Bulgakov and Mann. Lidia Zamkow directed a famous, highly innovative interpretation of Slowacki's Lilla Veneda (1973), while Skuszanka and Krasowki also mounted many of their own productions. Skuszanka explored the Polish national identity in her stagings of Romantic dramas and of Wyspianski's Acropolis (1978). Krasowski, more concrete and less poetic, explored historical mechanisms, often creating overtly political theatre. His productions included Przybyszewska's The Danton Case (1975) and Zurek's A Hundred Hands, A Hundred Daggers (1979). In 1980 the Słowacki Theatre staged the world premiere of Karol Wojtyła's Brother of Our God directed by Skuszanka, a production whose significance was above all political. Skuszanka and Krasowski stepped down as directors of the theatre one year later when a conflict developed between them and the acting ensemble. Andrzej Kijowski was appointed the new director, though his tenure was to end within several months with the declaration of Martial Law. He was replaced Mikołaj Grabowski (1982-1985), who went on to direct six productions, including Gombrowicz's Trans-Atlantic with Jan Peszek as Gonzalo (1982), Rzewuski's November (1983) and Krasiński's Iridion (1983). All of these productions were in a single vein, exploring the Polish identity as it had emerged from Sarmatian tradition. In two famous productions of the works of Boguslaw Schaeffer, Quartet For Actors (1982) and Script For A Non-Existent But Possible Instrumental Actor (1984), Grabowski considered the nature of theatricality, while the actors, lead by Jan Peszek, received an opportunity to demonstrate their skills and artistry. Andrzej Strzelecki and Rudolf Ziolo directed productions in which they portrayed the world as cruel and ruled by fear. Their projects included Bulgakov's The Dog's Heart (1983), Sologub's The Little Devil (1985) and Witkacy's Them (1985). The authorities at the time did not look with favour upon Grabowski's achievements and his removal from the position of director was something of a surprise. When Jan Paweł Gawlik became the theatre's director (1985-1989), the Słowacki entered a period of isolation. Gawlik proved incapable of recruiting exceptional directors as collaborators. The theatre was consumed by crisis. A general overhaul of the building was begun and the tenures of subsequent directors proved very short. In 1989-1990 Jan Prochyra was appointed director of the Słowacki, but was rejected by a vast part of the acting ensemble. He was followed by Jerzy Goliński (1990-1992). Bogdan Hussakowski became director of the Kraków stage (1992-1999) and invited Walery Fokin to work with him. Mikołaj Grabowski also returned to direct at the Słowacki, alongside Hussakowski and Waldemar Zawodziński. Krzysztof Orzechowski has managed the Słowacki Theatre since 1999. One of the theatre's most important collaborators is Barbara Sass, who has mounted a number of important productions here, including Arthur Miller's The Crucible (2000), Dostoyevsky's The Idiot (2002) - a story of the world of human pretences and passions - and the contemporary Helver's Night by Ingmar Villqist (2001). Tadeusz Bradecki has directed productions of Weiss' Marat/Sade (2001) and Shakespeare's Love's Labour Lost (2003). Grzegorz Wisniewski staged an adaptation of Witold Gombrowicz's short stories titled The Events of the Brig Banbury (1999) as well as Chekhov's Platonov (2000). Presentations of the theatre classics have included Sophocles' Oedipus Rexdi rected by Waldemar Smigasiewicz (2000), and Moliere's Le Malade Imaginaire directed by Giovanni Pampiglione (2002). The Miniature stage features presentations of contemporary plays from Poland and abroad. The theatre also opened a third stage, the open-air Stage by the Pump, which is active during the summer months and primarily serves as a venue for poetry readings.